How does F-Response Universal work? F-Response Universal uses a patent pending remote connectivity technology that enables an authenticated, read-only connection to be created between the examiner's computer and the computer(s) under inspection, over any network. F-Response Universal readily traverses most firewalls, NAT/PAT routers, and other complex networking technologies making it remarkably fast and easy to connect to remote systems almost anywhere in the world. F-Response Universal is sold as a virtual appliance in 1 and 3 year license durations. What are the advantages of F-Response Universal over F-Response Enterprise? F-Response Universal provides access to remote Windows, Linux, and Apple OSX devices via the network, much like F-Response Enterprise. However, F-Response Universal does not require dongle(s), optionally integrates with most SIEM products via remote syslog, supports Active Directory authentication, provides the full deployment console to all authenticated examiners, and uses cutting edge compression to improve performance of imaging and analysis operations. In addition, F-Response Universal often does not require firewall modifications and is completely encrypted by default. For additional differences between F-Response Universal and the entire F-Response product suite see the Product Matrix. Who would use F-Response Universal? F-Response Universal was designed to give litigation teams extended geographic and technical reach to access unlimited live remote machines data in a completely write protected manner. Once connected, the files and folders on remote devices are presented via a DiscoveryShare(TM), giving litigation teams the ability to review data by simply using the Windows file browser for quick review, or their litigation tools for more extensive research. F-Response Universal includes access to remote physical disks, volumes, partitions, and RAID devices, allowing a Forensic examiner to leverage existing tools, techniques, and methodologies to perform investigations with pinpoint accuracy and precision. F-Response Universal presents remote Windows computer physical memory via the MemoryShare(TM) as a live image file, giving the handler the ability to simply collect the image file or analyze it using a popular forensics tool such as Volatility. The image file is not a snapshot of the remote physical memory, rather it represents the live physical memory of the remote machine. F-Response Universal attached MemoryShare(TM), providing access to the remote Windows computer's Physical Memory in real time. 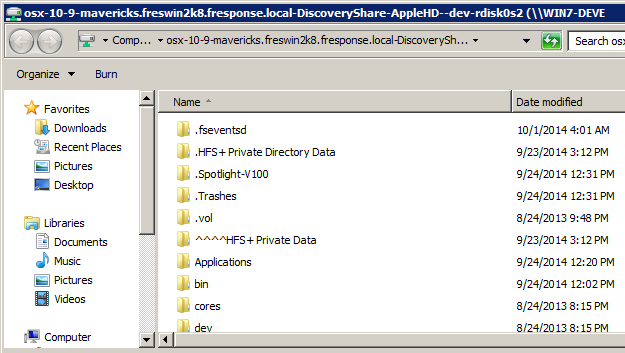 DiscoveryShares(TM) allow F-Response Universal users to access a remote machine's files and folders completely read-only with no file locking, whether they be Windows, Linux, or Apple OSX. DiscoveryShares(TM) offer a great way for both technical and non-technical users to access a remote machine's files and folders. F-Response Universal offers the ability to deploy to remote systems via the browser, email, LAN/WAN, and MSI. Deployment capability does not require a dongle, all authenticated Universal examiners have the ability to use the full deployment console. F-Response Universal provides immediate, live, read-only access to the remote target computer's files. Since all access is at the physical level there is no file level locking, F-Response Universal gives you access to any and all content on the remote target, including protected system content (Registry files, Email PSTs, Database Files, etc). 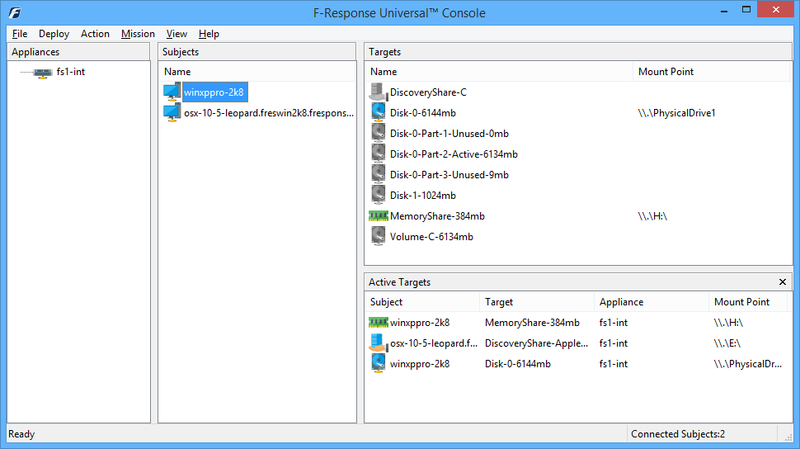 F-Response Universal provides access to remote physical memory via MemoryShares(TM). MemoryShares(TM) provide live physical memory access to remote Windows subject physical memory as a live file, suitable for imaging and analysis with virtually any incident response product. All subject data in transit when using F-Response Universal is encrypted using AES 256 bit symmetric encryption. Multi-platform support is included in F-Response Universal, further extending the team's reach into Linux and Apple platforms. Remote Linux and Apple files can be reviewed through the DiscoveryShare(TM) using the Windows Browser. F-Response Universal Supports Apple OSX 10.3+ (Note: SIP must be disabled in 10.13+) and Linux Distributions 2002+. F-Response Universal is sold in 1 and 3 year license terms. Virtual Appliances are available for VSphere, HyperV, and Xen server class virtualization platforms. F-Response Universal has no licensed limit to the number of concurrent examiners or connections (actual performance may vary based on bandwidth, region networks, client systems, etc). F-Response Univeral is available in 1 and 3 year license terms and can be purchased directly from F-Response.com. Buy F-Response Universal. IMPORTANT NOTE: Always remember, all renewal prices are available here on our website, and all licenses of F-Response automatically include maintenance, support, online training, enhancements, implementation assistance, and new releases throughout the term of your license.